There are tons of apps, tools & programs for task management & business organization but there are many direct sales and network marketing specific activities that those apps aren't set up to help with. That's exactly why I created this printable direct sales success system toolkit & business planner for my own business several years ago. 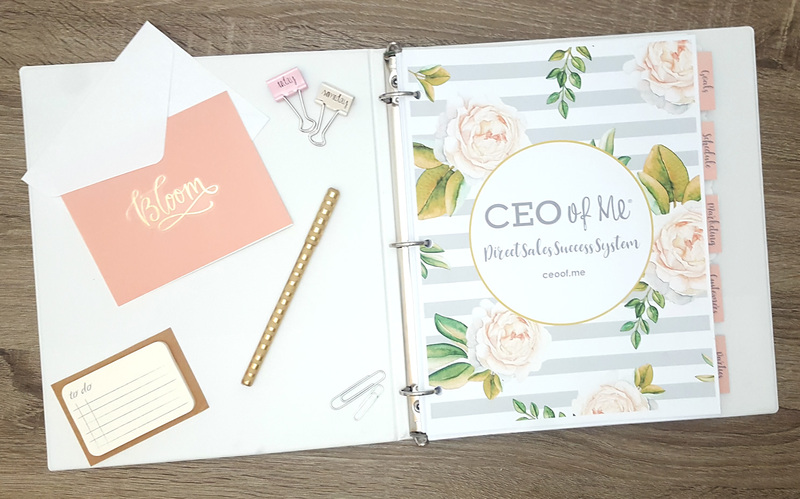 I needed something to help me get organized and implement systems for the key areas of my busy business so I could stay on track, work smarter & be more productive. 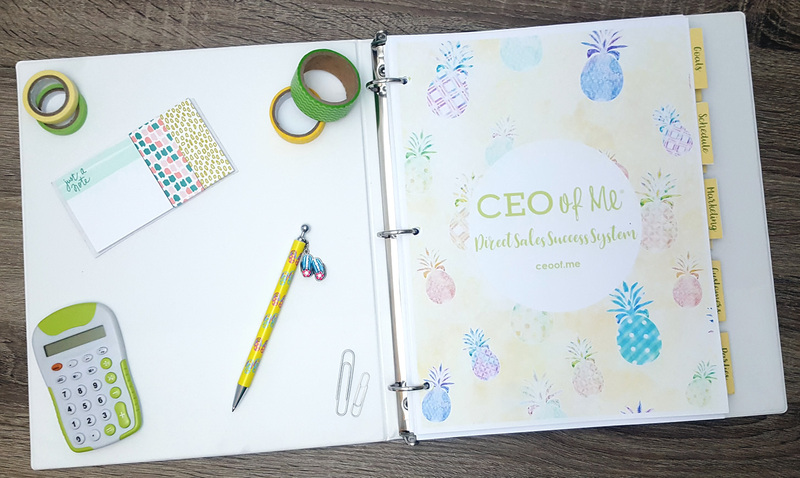 Over the past 3 years, thousands of direct sellers and network marketers have purchased my printable toolkit to implement systems & scale their business. It's not specific to any company or business and can be easily customized. THIS IS NOT A CALENDAR PLANNER OR A PRINT ALL - ONE AND DONE - ONCE A YEAR - TYPE PLANNER. 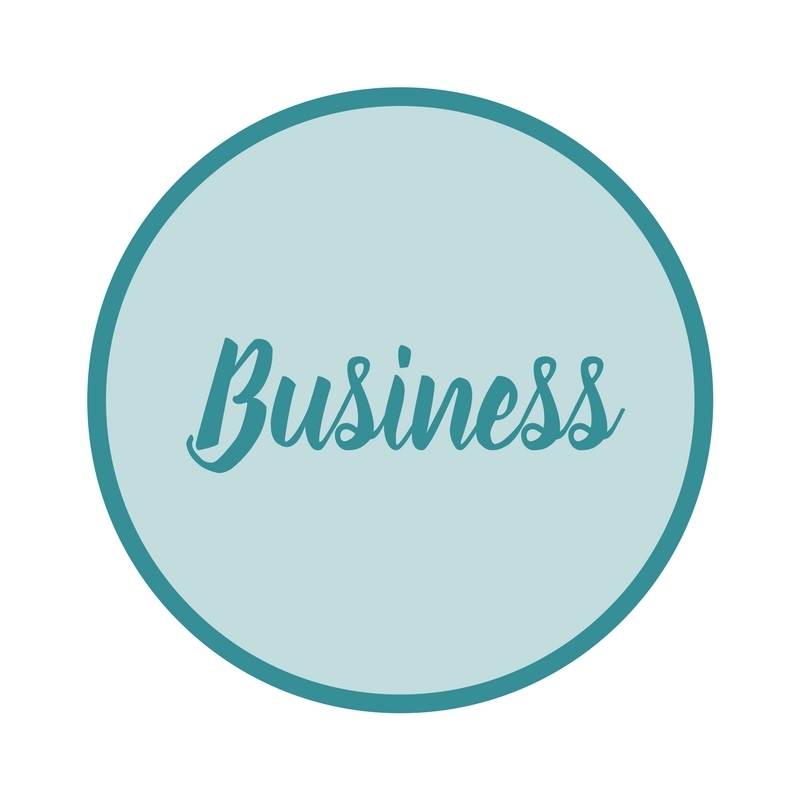 This is a business and productivity toolkit with over 75 different worksheets, templates, tracking and planning pages for all the key areas in your business. You can pick and choose which templates and worksheets you need for your own business, print them and print more as you need them. 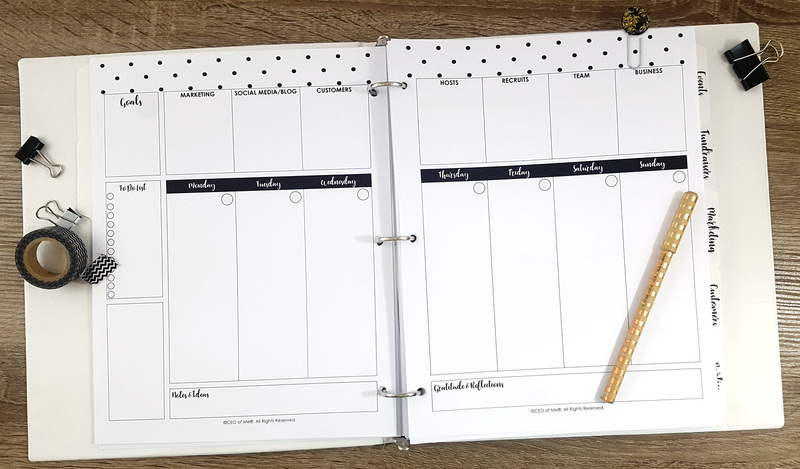 There are also monthly, weekly and daily calendar and planning pages in multiple layouts for those want to also use it as a calendar planner during the year. 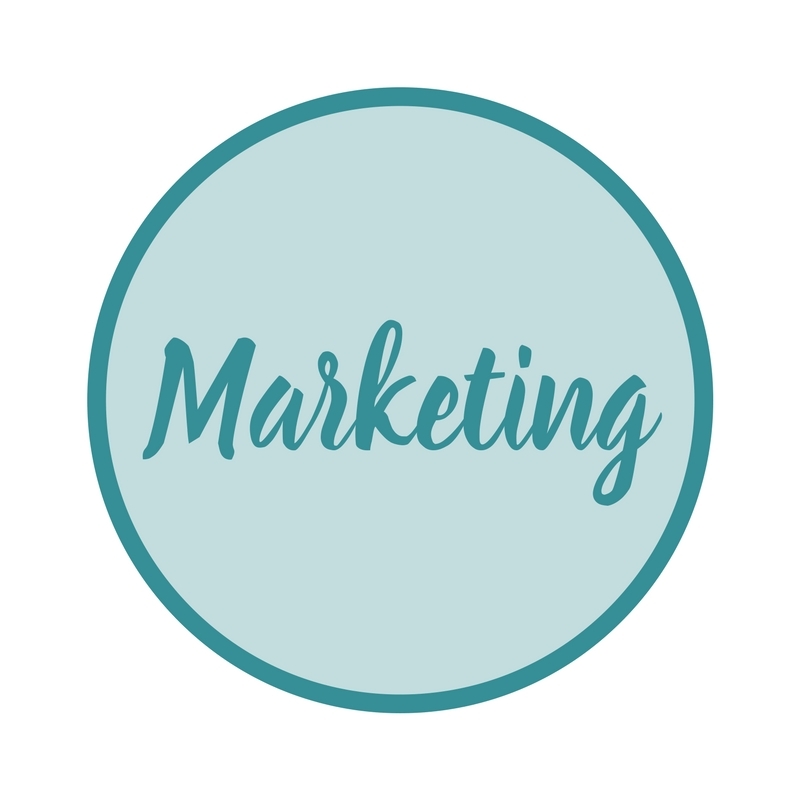 However, the magic of this is in how it helps you create systems, stay organized and work smarter in the many different areas of your business like marketing, customers, follow up, events, parties, team building, finances and business tracking. 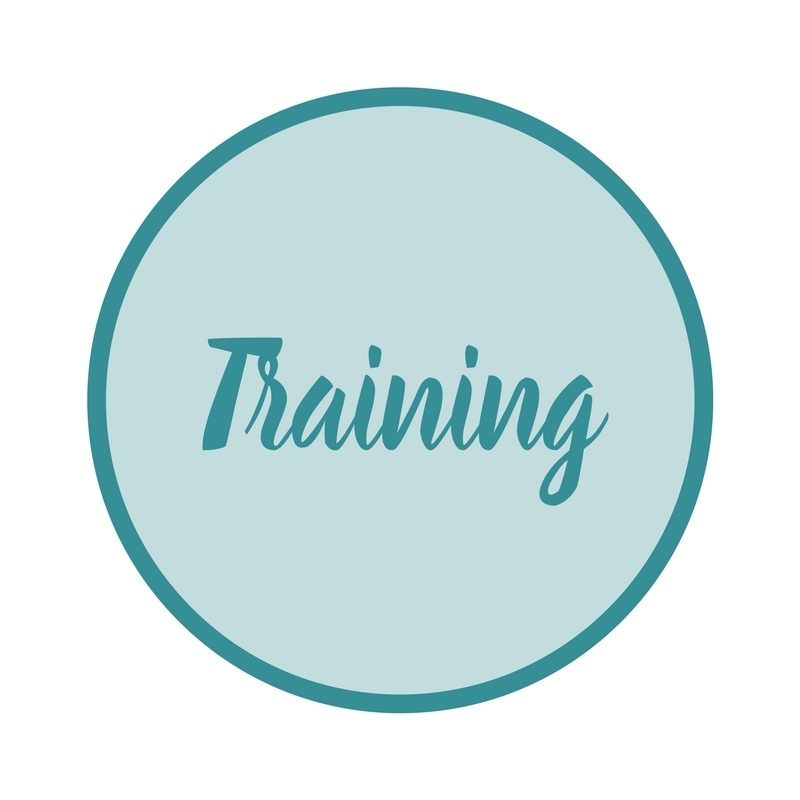 PLUS, you will get access to training videos and courses to help you with creating a schedule that works for you, increasing your productivity and being more consistent in working your business. Sounds good, doesn't it? 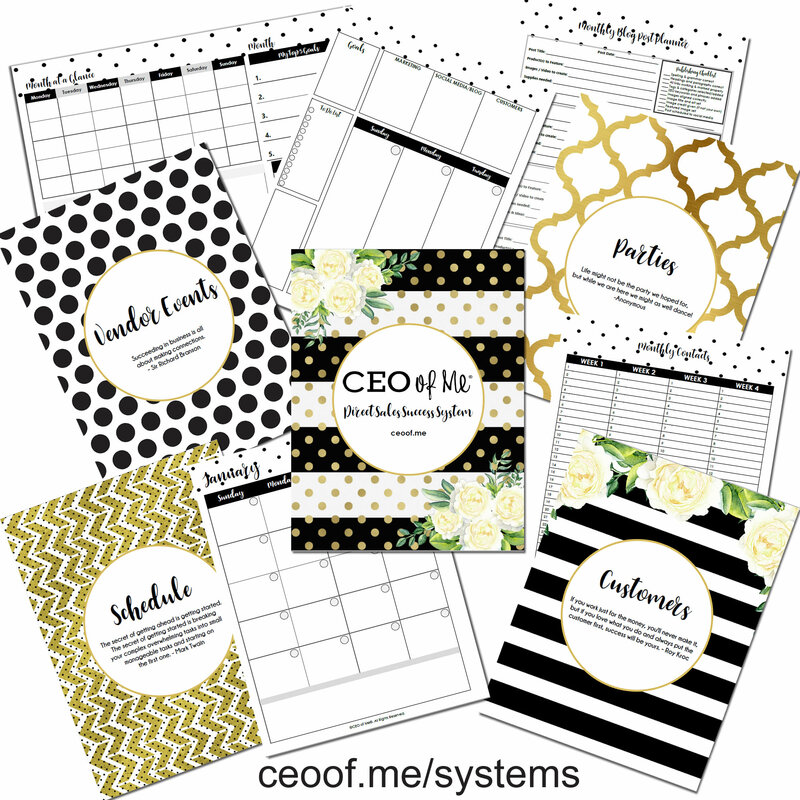 It can be your all-in-one organizer for your business so you can get your act together, save time, work smarter, be more productive and rock your role as a CEO of Me® too! 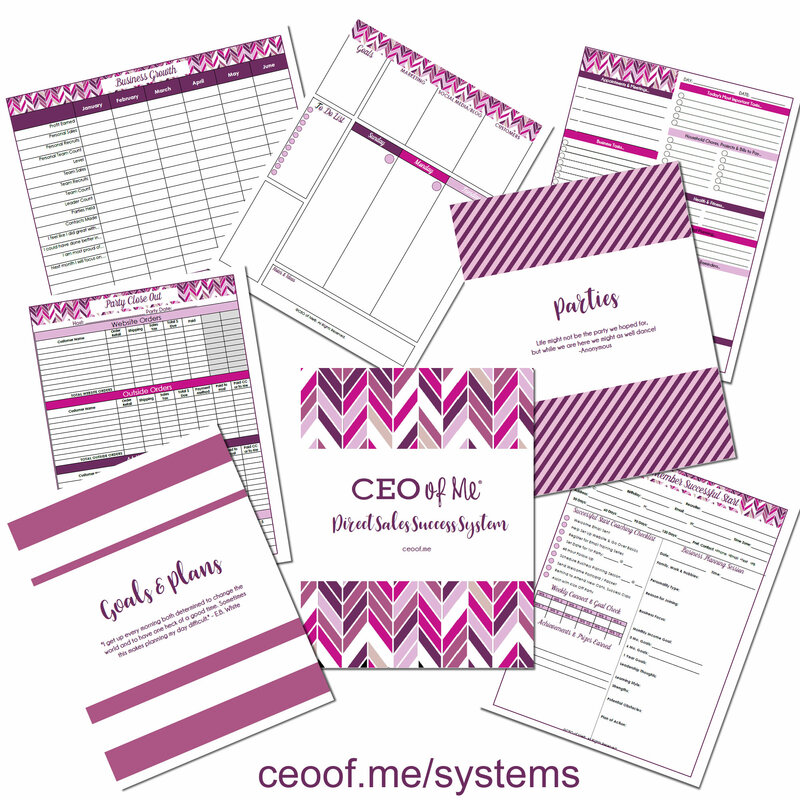 The CEO of Me® Direct Sales Success System & Planner includes over 75 different templates, worksheets, planning pages and tools for Goals, Scheduling, Marketing & Lead Generation, Customers & Relationship Building, Parties (Home/Online/Classes/Demo's/Workshops/Gatherings/Whatever you call them), Vendor Events, Fundraisers, Recruiting & Onboarding, Team Leadership & Business Management. 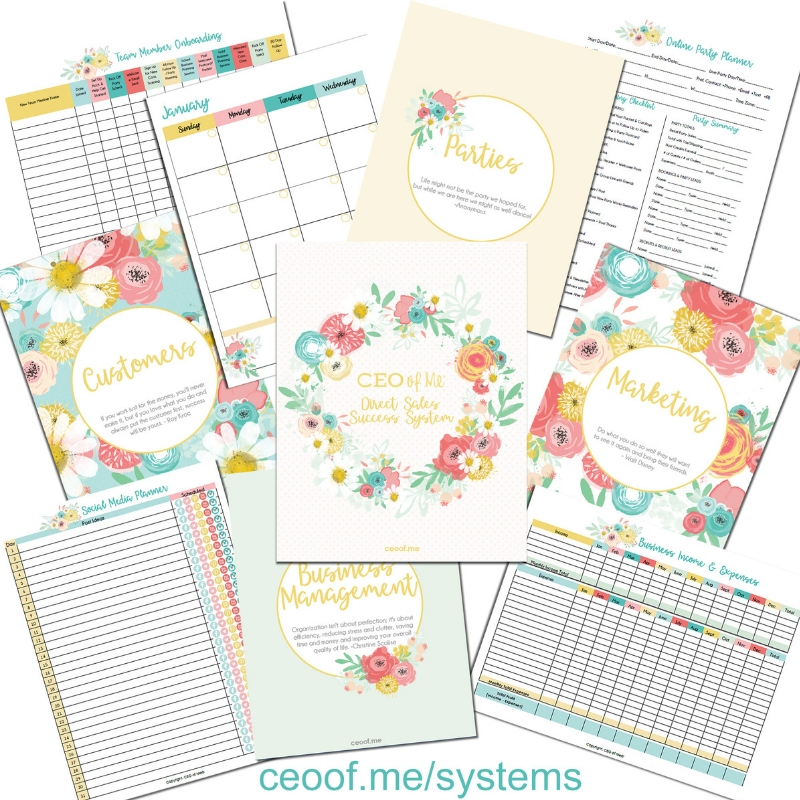 These checklists, planning pages and worksheets are practical and also pretty! 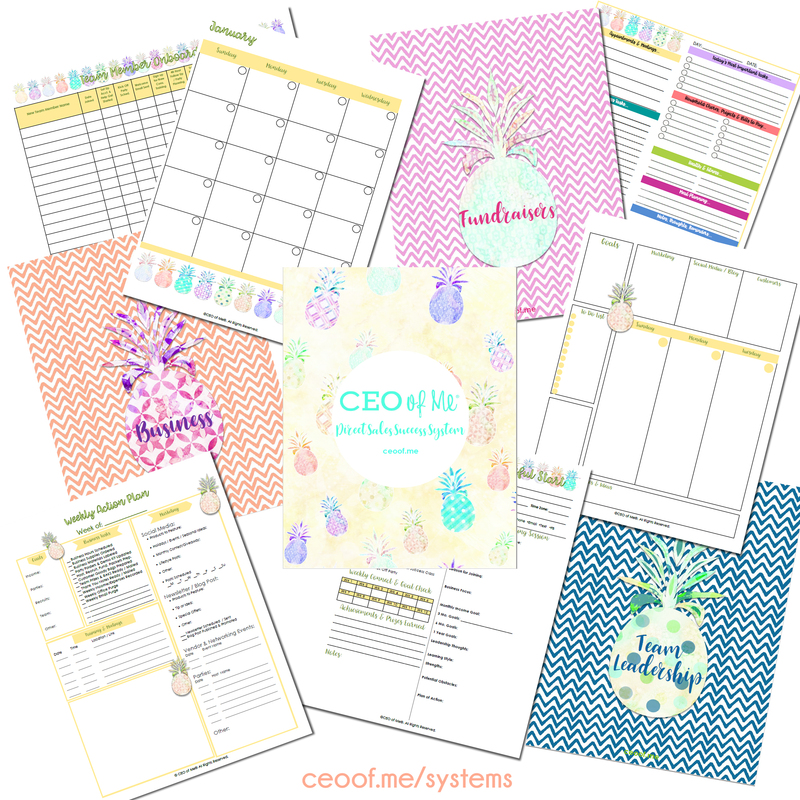 With NOW SEVEN gorgeous (but still ink friendly) designs, you can choose your favorite, match your personal style (or company / team colors) or switch them out each month, color code your systems and create something you love to look at and use too. 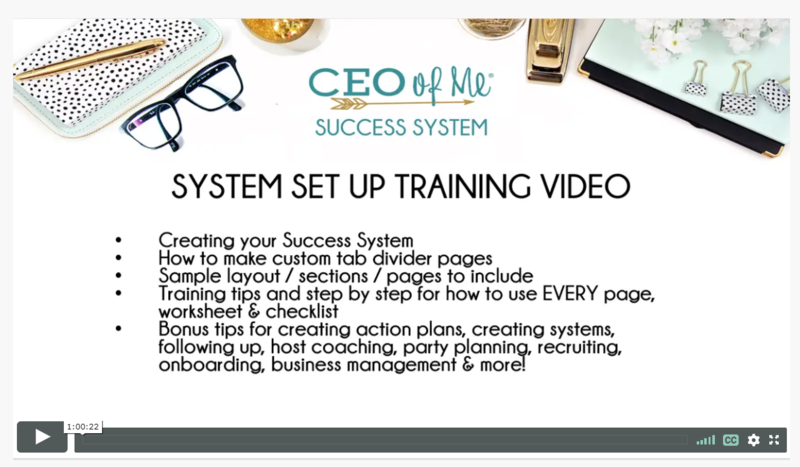 Included with the Success System is an in-depth, hour-long training video where I will show you how to set up your systems and exactly how to use each page and worksheet. 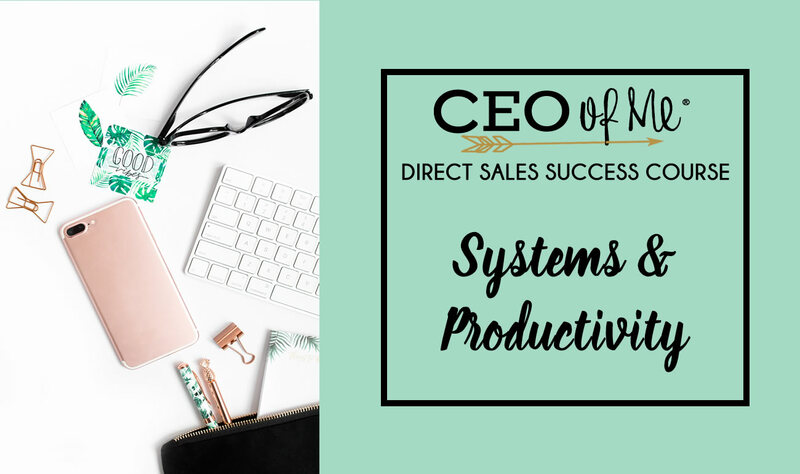 I'm also giving you bonus access to a Productivity for Direct Sellers Training Course to help you learn how to prioritize, create theme days, batch your tasks, be more productive, work smarter and get more results! 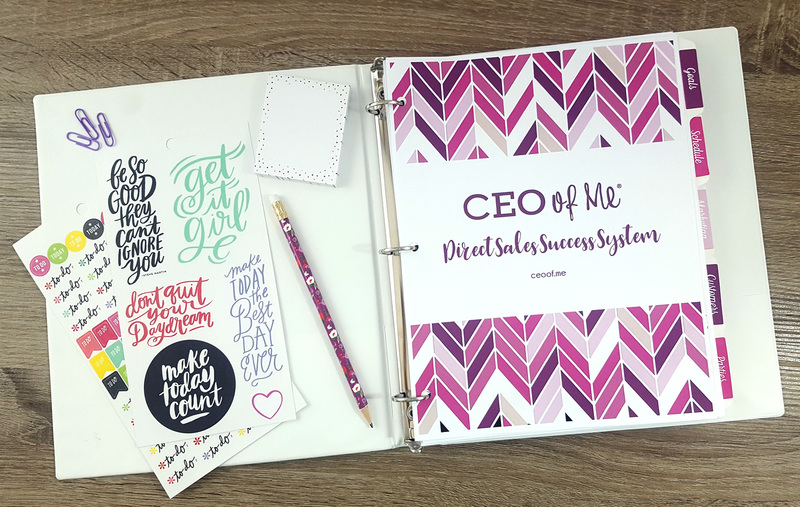 Pretty and practical pages are nice, but I want to help you actually get your systems in place so you can stop wasting time & spinning your wheels. Let's get you in control and feeling confident about the activities and actions you need to take to move your business forward every day! Choose your favorite design or go all in and get my Success Planning & Productivity Bundle for 60% off today! Vendor Events are an easy, fun and incredible way to grow your business! This section includes pages to help you keep track of your upcoming events and make sure you have all the materials, tools, set up and info you need to have successful events. 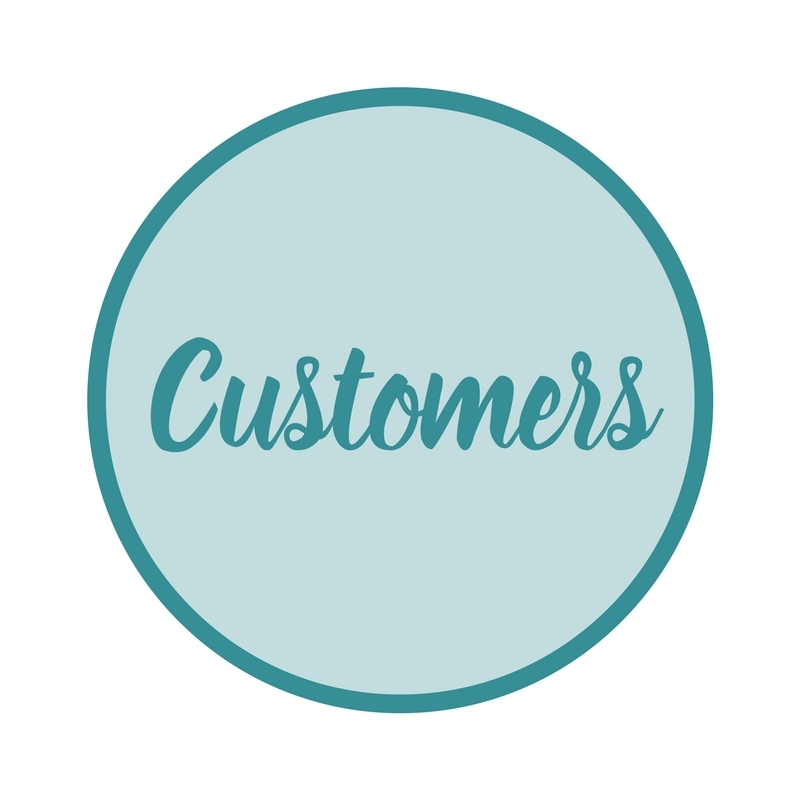 Pages include: Upcoming Events, Vendor Event Planner and you can use the Customer Info page from the Customer Section here too. Fundraisers are another great way to market your business while giving back to your community and those in need. The Fundraiser section includes a planning page to help you with tracking your event information, strategy, totals and follow up. Pages include: Fundraiser Planner and you can use the Customer Info page from the Customer Section here too. The final section in the Success System is the Training Section. 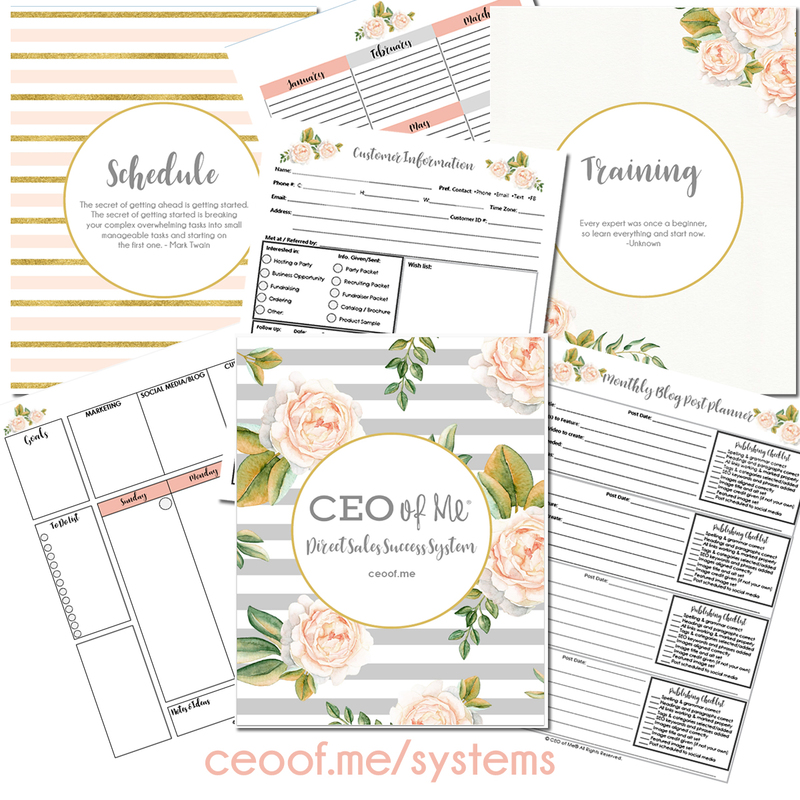 You can use this section for the workbook and notes from the Schedule & Productivity Course, Planner Set Up Training any other training handouts, checklists or tools from CEO of Me, your company or other resources. 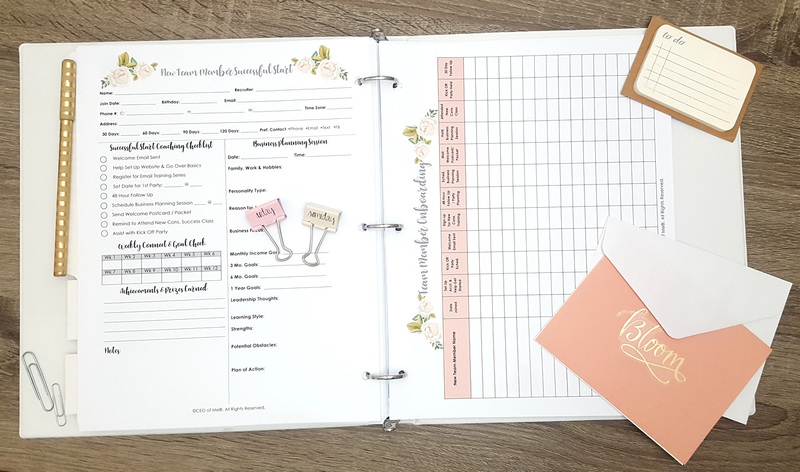 PLUS there are over 15 other bonus pages and worksheets included that are not listed above from blank Graph / 30 Day Tracking Pages to Month at a Glance, Weekly Theme & Daily Power Hours, 12 Month at a Glance, Daily Journal Page, Weekly Gratitude Page & more! There are currently 7 different designs available & 2 more being added in 2019! 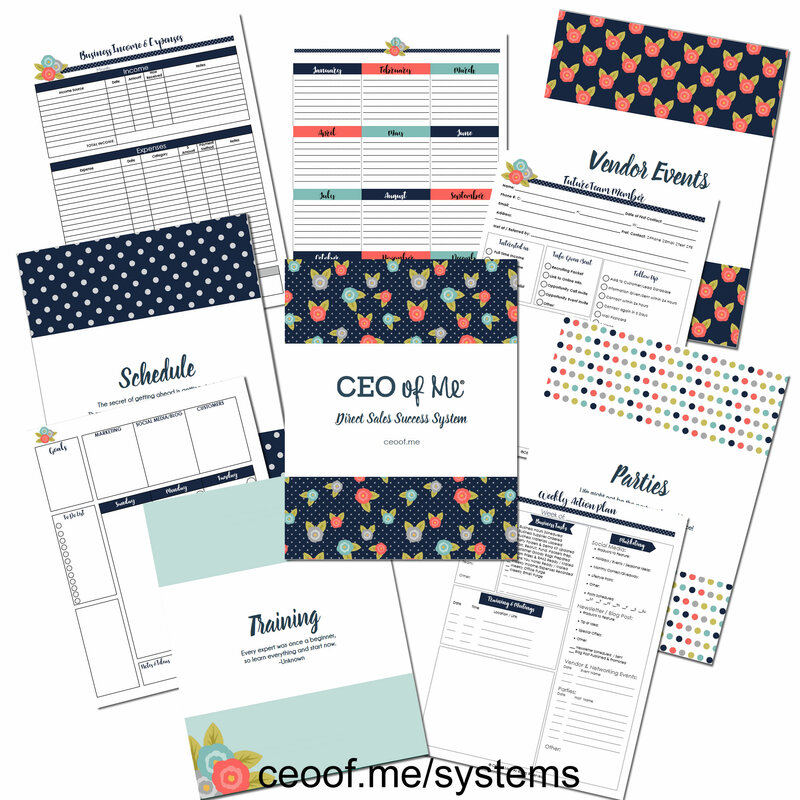 This is much more than a printable business planner tho! 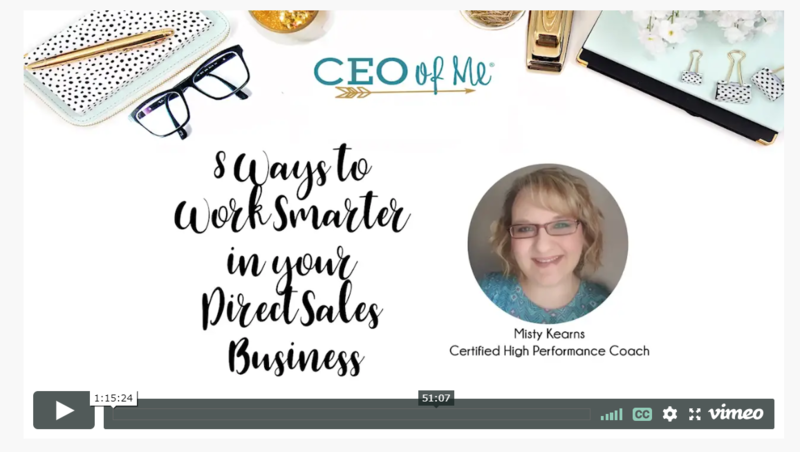 You'll also receive access to a over 2 Hours of Training Videos where I will show you how to create systems and use each page/section of the toolkit AND my Productivity Training Class with 8 Ways to Work Smarter in Direct Sales for FREE! Watch the Video Below to see the System Pages Up Close! Ready to Get Organized? Purchase your Success System Now & Get Immediate Access to the Digital Download & the Systems & Productivity Training! 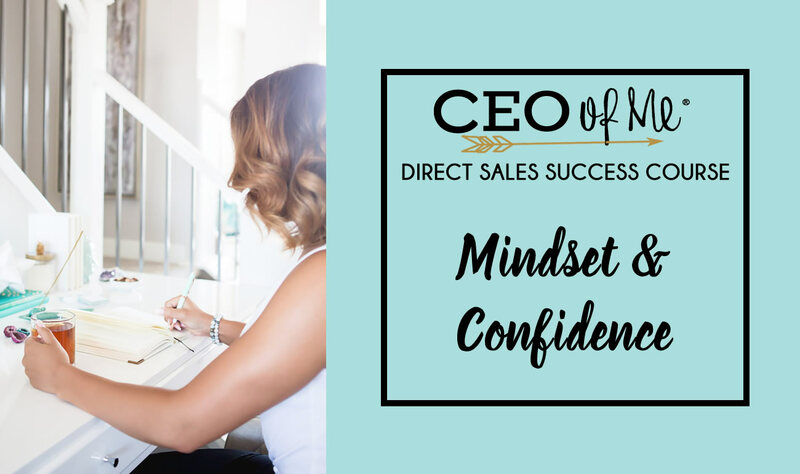 Premium Access to ALL current & future Success System Designs plus access to my Success Foundation Course which includes 3 Classes, Workbooks & Tools to help you create & implement the mindset, systems and marketing of a CEO of Me so you can get more results, be more confident, productive and consistent in growing your business! 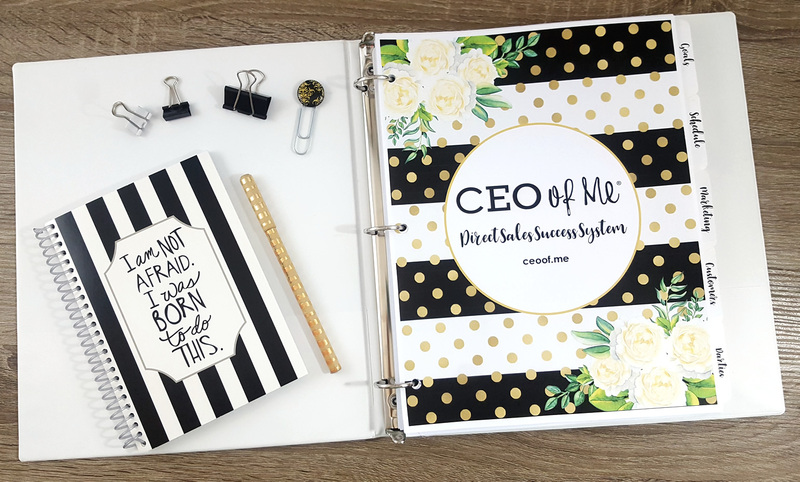 The CEO of Me Success Foundation Course includes over 10 hours of video training (captions and transcripts included), classes, workbooks, tutorials, step by step action plans, checklists, tools and bonus resources to help you step into the role of a confident CEO! I'll send you emails over 90 days to help you with completing the course, implementing what you learn, give extra accountability, support & ideas as you move forward too! Reg. Price $37, Save $10! Access to ALL 7 Current Designs AND all Future Designs too! Best Value - Save Over 60%! Premium Access to ALL Success System Designs including ALL 7 Current Designs AND all Future Designs too! This system helps me keep organized and has helped me increase my show bookings & repeat customers! The chaos is finally under control! The planner has guided me to running my business more like an actual business and not just a hobby. 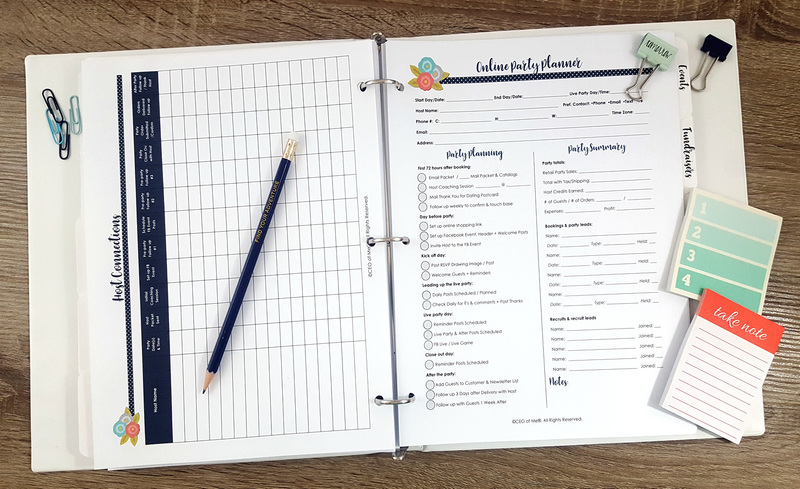 I love the ease of this planner & the ability to customize it for my business! I would suggest this system to anyone who needs help keeping track of their business and life. I am in love with my planner! 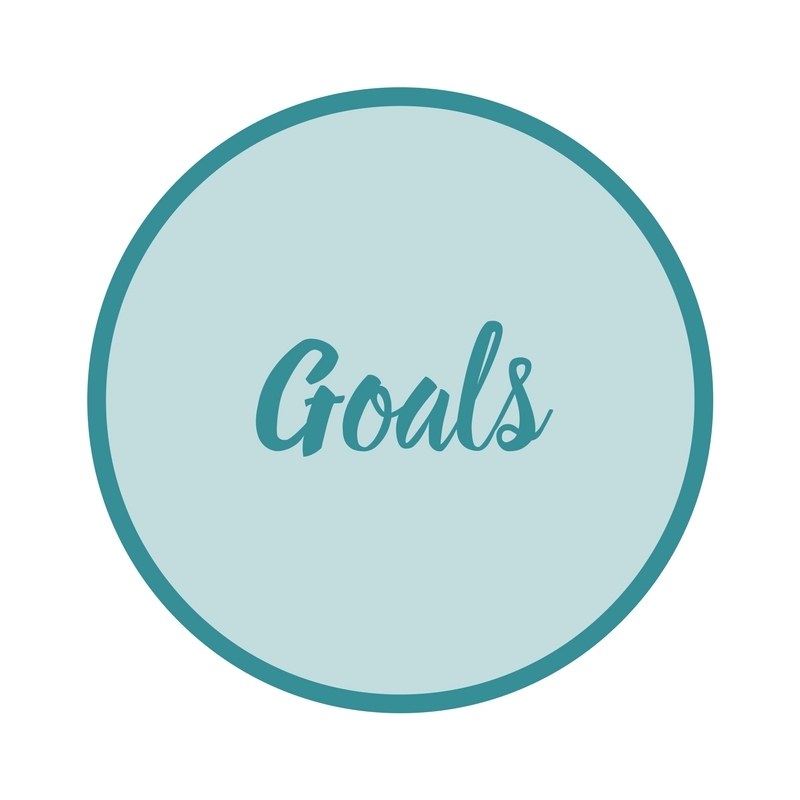 The success system has made a huge difference in my time management and how I plan and keep records for my business. The Success Foundation Courses have had an immense impact on my business! I now have a plan in place and feel so much more confident! Question: Is this a physical product I will receive in the mail or digital download? How will I receive it? Answer: This is a printable planner only. It is a digital download via a zip file and all files are PDF files. Once you purchase, you'll receive an email with your access info and you can download it from your member's area on my website. I do not offer a printed version of it. This system is customizable and meant for you to use the pages you need, skip the ones you don't and print more as you need it for years to come. Question: I already have a calendar planner that I love, how is this different? Answer: The CEO of Me Success System Planner is not really a "calendar" planner. 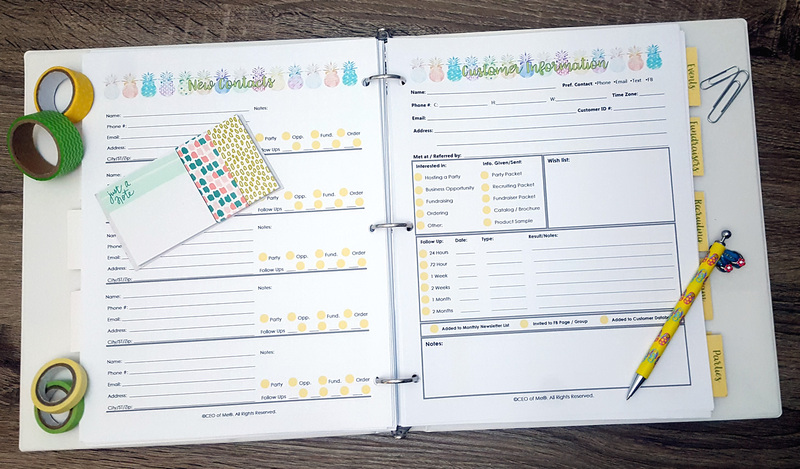 It does come with multiple monthly, weekly and daily planning pages for those who want to use it for scheduling but it is really more of a Business Planner & Systems Toolkit for your Business since it includes sections, worksheets, checklists and tools to use to create and implement systems in all areas of your business so you can be more organized and work smarter. Question: Can I buy this and then share the files with my team or other direct sellers? Answer: No, your purchase entitles you to only ONE licence of the planner for your own personal/business use. The planner is copyrighted and sharing, selling, distributing, copying it to give or sell to someone else is illegal and also just not nice. I do however offer a very generous affiliate program where you can make a commission from referring others to purchase the planner. Question: Will I have to purchase the planner again each year? Answer: You will have lifetime access to whatever design you purchase (or all designs if you choose the Premium Access option). You can login to your account to re-download it anytime. The calendar pages are undated so you can print it again year after year and will not need to purchase a new one. Question: I don't really do parties for my business, will this planner still help me? Answer: Yes, absolutely! It is not focused on parties, parties is only 1 section of the planner. It is made to work for anyone in direct sales, network marketing or traditional party plan company to use to create & implement systems, get organized and work smarter. Question: What if I already purchased a previous version of your planner? Do I get access to the new version? Answer: If you purchased the previous version of the Success System you can login at access.ceoof.me and access your purchases anytime. If you purchased the system before April 30, 2018 or purchased the Premium Access option, you will have access to all current and upcoming designs. Question: What size are the pages? Is this set up to be printed for smaller planners like the Happy Planner or A5/A4 size planner? Answer: The files come in 8 1/2 x 11 full page size. You can use Adobe PDF to "print to scale" option and print the pages smaller to fit the standard 7x9 planners like the Happy Planner or smaller for A5/A4 and simply trim the excess of the page. We find that the worksheets are best suited for at least 7x9 or larger size binders. Question: Can I have this printed at Office Depot or other stores or somewhere online? Answer: Yes. You will receive a single licence copy of the planner files and you may have it printed at any copy shop in person or online. However, we find that it is best to print ONLY the pages yourself as you need them and print more each month or quarter rather than having it printed in a mass bundle somewhere. The Success System is set up for you to create a customized toolkit and organizer suited especially for your own business needs. You will most likely not use all of the pages and may need more of 1 page than another. We recommend the HP Instant Print Printers & Instant Ink Program as a very affordable option for printing at home. The printers are $40-80 and you can print 100-400 pages a month for as little as $4-10 a month which is way more affordable than having it printed somewhere. direct sales business doesn't have to be stressful or overwhelming! 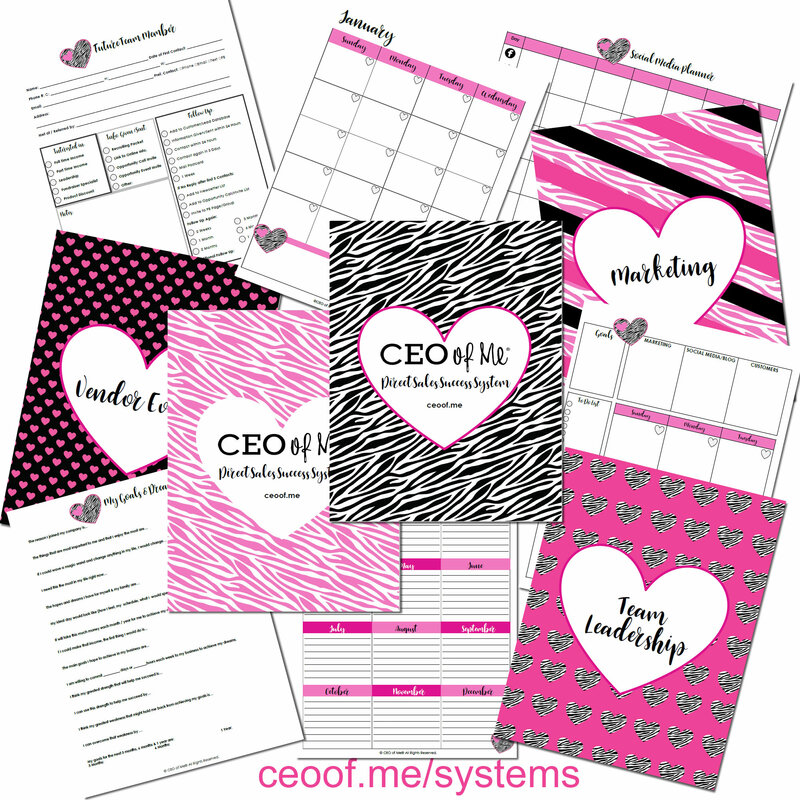 Let me help you work smarter, be more productive, get organized and manage your biz like a CEO! 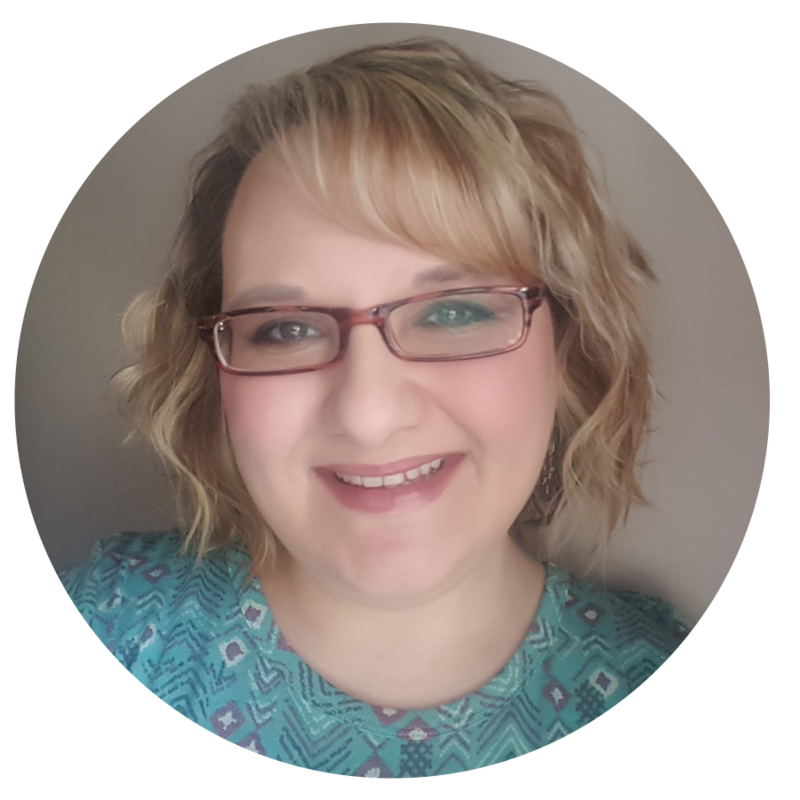 Hello there, I'm Misty Kearns, Coach and mentor for direct sellers and network marketers! I'm a small town girl who loves the beach & hates getting up early. I'm an introvert who struggles with self-confidence & not being a perfectionist. I never dreamed I would build a career in direct sales & leadership much less become a Business Coach. I started in direct sales in 2006 for the discount with no intention of building a business. Back then I was 24/25 years old. 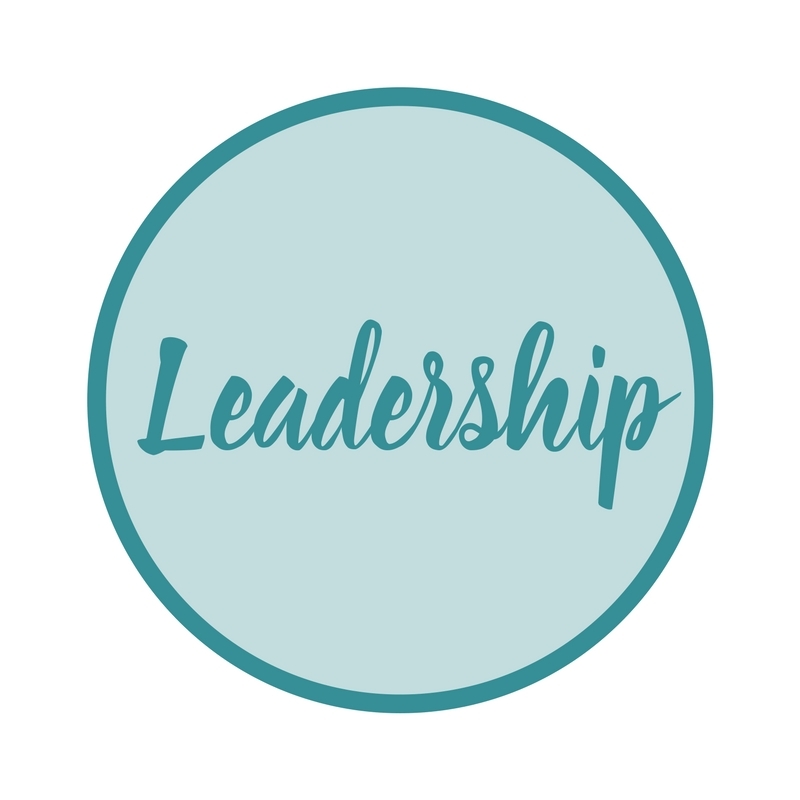 I didn't have any confidence and I thought there was no way, Jose that I could speak in front of people much less be a team leader! After losing my full time job (cough, cough, actually getting fired...) and really, really (did I say really?) not wanting to go back to the corporate world, I decided to dive into my direct sales biz until I figured out what I was going to do next. I was deep in debt and not sure about this whole direct sales thing, but I knew I wanted something more for my life and a career I could be passionate about. I found out I loved direct sales & my life was forever changed! I was able to replace my full time income in less than 6 months. A year after losing that job I earned my first free trip to Hawaii, then the keys & title to my own free convertible! As a top leader, I consistently placed in the top 20 Directors for my Region & even as #17 in the US & Canada for 2008-2009. Direct Sales is about so much more than the income & prizes though. It is about using what you gain from the business to help you reach your goals and improve your life. It's about building your own confidence, being part of a supportive tribe and making a difference in other's lives. I have loved getting to be my own boss & it's a true joy to get to inspire others to be more confident, authentic & successful too. My true passion is empowering & teaching others how to build their own successful business too. 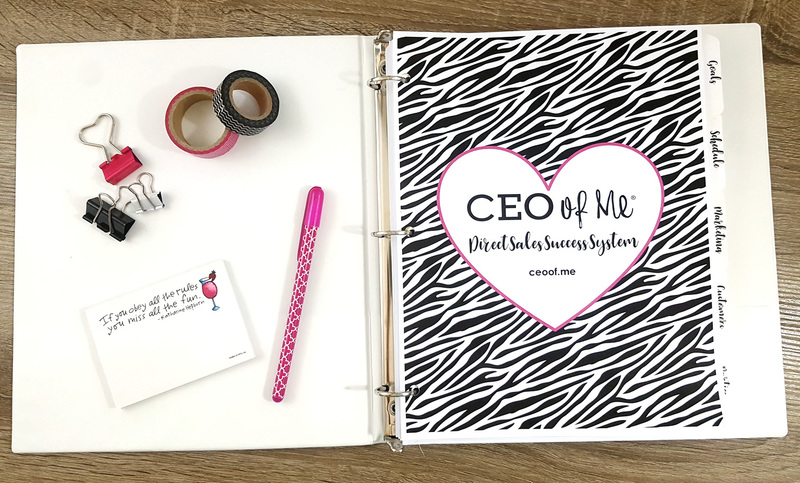 After being a Top Leader with my company for many years, I started this little blog called CEO of Me® to share my journey, tips and ideas. This led me to begin selling some of the custom tools and templates I had created for my own business. 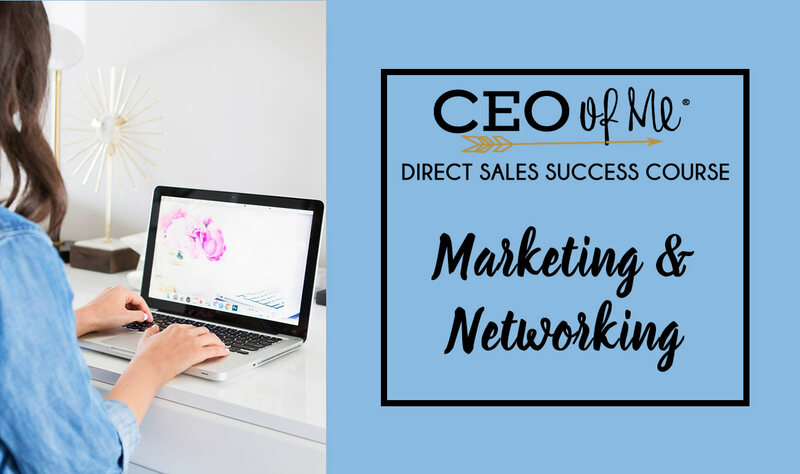 I realized that I was being called to move on from my direct sales career and become a coach so that I could help other direct sales/network marketing professionals reach their goals and dreams too. The first version of the Success System / Planner was something I created for myself and my team to help us all manage, track and organize our businesses. I called it the "Business Binder" back then and it was more specific to the direct sales company I was with. 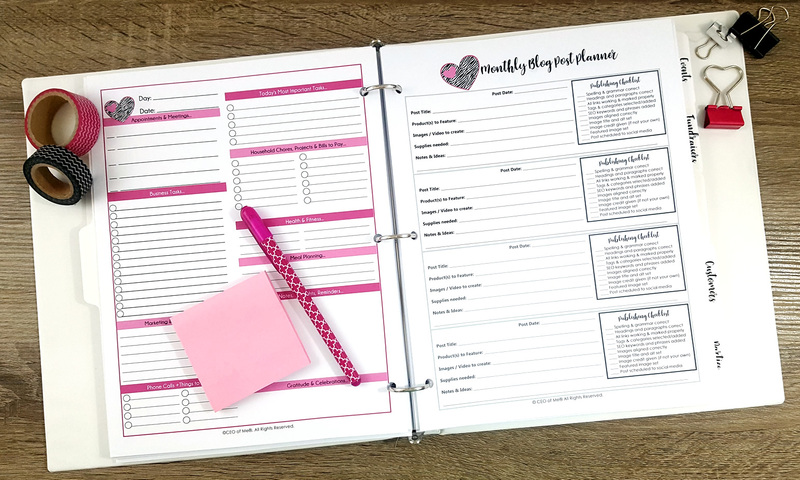 After networking with other direct sellers, they started asking me to share my planner pages and checklists, I created a generic version and began selling it online in 2014. The Success System has evolved, improved and increased in pages as well as improved designs since then as I have received a lot of feedback, page ideas and requests. Plus I love designing and enjoy creating pretty and functional tools that help others! In addition to the printable pages/system you'll also get access to training videos where I will show you how to create an efficient schedule, how to prioritize, how to utilize this system and other tools to reduce the chaos and frustration so you can increase your productivity & results. 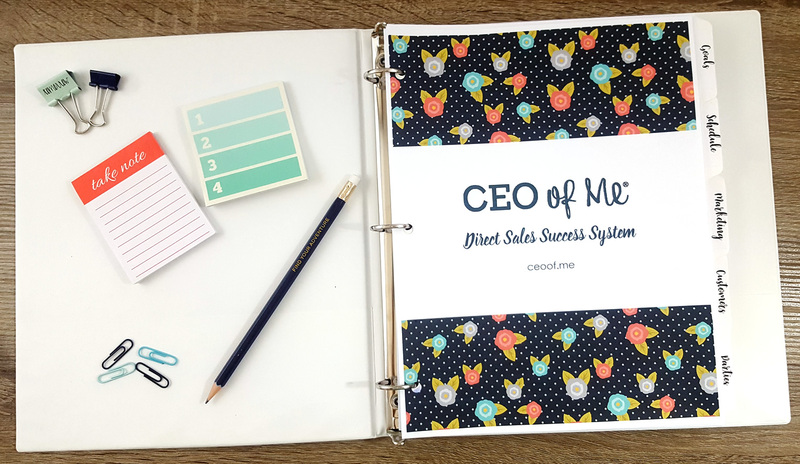 I know if you implement this system you'll be able to work smarter too, just like the thousands of other direct sellers who are using the CEO of Me Success System. All sales final. No refunds. This is digital product & meant for personal use only. You will receive an email with the link to access to the download links & Training Videos after completing your purchase. 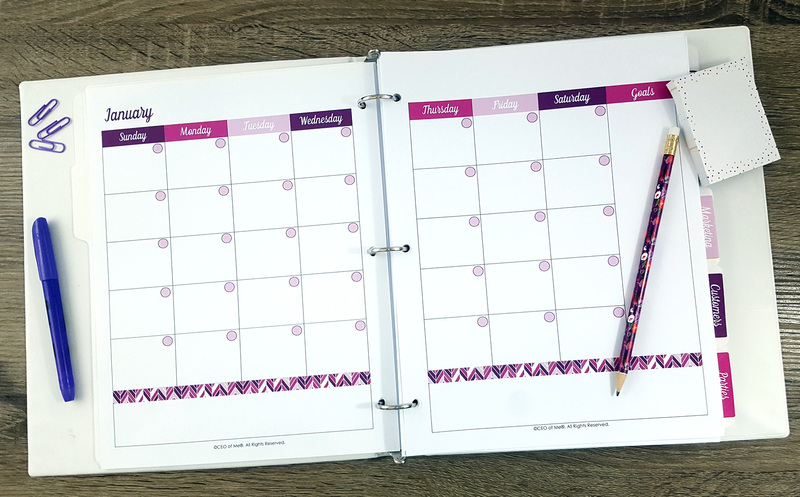 This is not a typical calendar planner - it is meant to be used more as a bundle of templates and a way to create a customized toolkit and business planner for your own business for you to print only the pages you need as often as you need them. By purchasing you agree to our terms. Copyright 2019. 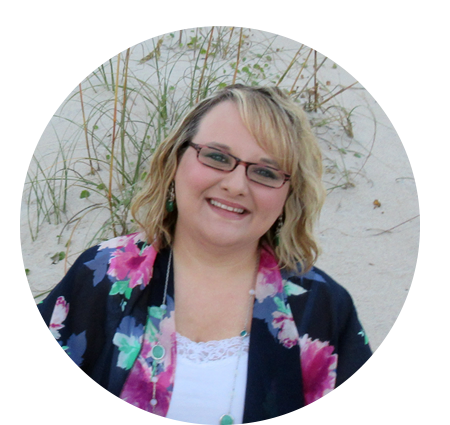 Misty Kearns, CEO of Me® , LLC. All rights reserved.